Do you wish to know how to MAKE a Living in property? 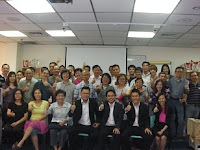 Do you wish to know the Basics 123 in investing in local property? Do you wish to know the Property market outlook in 2013? 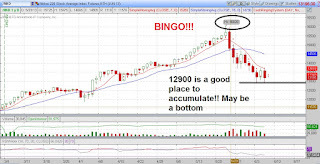 Recently on radio, we did mention we predict gold to be heading for 1200. It sure looks weak at this moment, Yesterday in the day, gold at one point drops $50 to reach a low of $1223. Like what we mentioned, we think that it is heading at least to 1200, where we think might have a strong support. Let us see if it happens. By the way, some of my friends recently asked, what should we do if we have position? Long term wise, we think you should never have invested in gold. It is on a long term downtrend, You will never see gold at $1930, the highest point, for the next 10 years. Short term wise, we think there is a rebound. You may want to take the opportunity to sell into the rebound. Good luck with trading gold, a "safe haven" that is never really safe! China is on its own. Instead of showing strength with Asia mostly up, it plummeted another 70 points bringing all Asia index down. The positive 30 plus points in STI got wiped out. The Nikkei plus 300 points now becomes a deficit of 200 points. China being the world 2nd largest economy sure is an influence. It is quoted "The Shanghai benchmark plunged 5.3% on Monday for its worst finish in nearly four years, as concerns that reluctance by China’s central bank to ease tight liquidity conditions in the interbank money markets would hurt small and medium-sized banks and borrowers"
What a bloody June. In fact from my point of view, the "Sell in May and go Away" effect is here this year. If you look at past historical years, it either comes in may or sometimes in early june. This year it started end of may, but the fall is felt more in early june. Dow reaches the highest peak on 22nd may. In fact a couple of weeks back, when STI plunged hard to 3100, a lot of us are still talking about buying what kind of stocks. This to me is never a sign of bottom. Psychologically, the retailers are still bullish. Always know that the bottom will only come when not many people discusses much about buying stocks anymore! Not when everybody wants to rush in to catch the bottom. Even if there is a rebound like STI recently, from 3100 to 3250 points, it is temporary. This is the psychology of how market works. 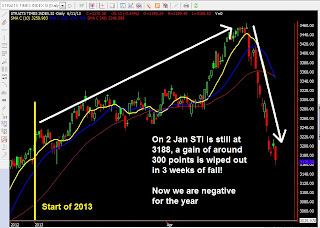 In fact i am looking at STI breaking the 3000 barrier. That may be the point that will send the market into despair. A very good gauge is to ask your remisier. Is he still getting orders to buy? If the answer is yes, the market probably has not bottomed. When the answer is no, that normally should be the bottom. Radio FM958 (Fri, today, 21 June 1.15pm) talking about When and How to Buy stocks? 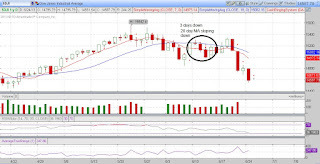 Gold collapsed again with a 90 points down day! With today's poor china report and Wallstreet predicting the end of QE soon, there seems to be no more good news for the gold. Do take note that we think gold has a support at 1200, a support that we think should hold agin mid term. So good luck to gold, it is 80 points away now! 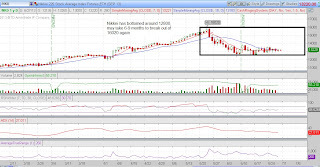 In the past, I did mention that STI at 3000-3100 is worth a look. I also mentioned that the recent run-up in STI may be short term. Today, we have a taste of how short term it may be... a 81 points drop in 1 day! This would have been unimaginable this year before today! Did you sense the market sentiment changing now? 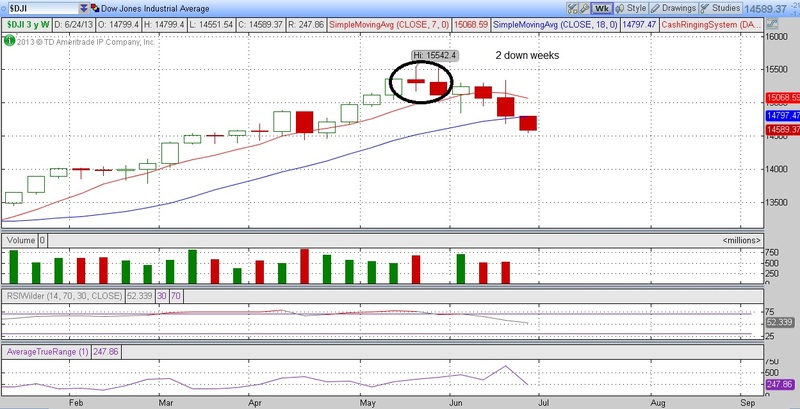 It seems so frequent nowadays that STI falls more than 40 points in 1 day, a sure sign of weakness in the market. I do now believe that with the recent US weakness and the QE effect over, STI might have a chance to reach 3000 points, the lower of my targeted 3000-3100 range. My target is now 3000. If reached, this would be a tremendous bonus! Anything below 3000 would be an angbao. Blue chip stocks do look cheap now... tasty... let us salivate more at 3000. DOW another 200 points drop today shaking the world, Will DOW reach 14000? "Federal Reserve Chairman Ben Bernanke said on Wednesday that the central bank may begin to scale back its $85-billion-a-month bond-buying program later this year if the economy continues to show strength." People in Wallstreet seems to ignore the word "IF", they just sell in assumption of the certain fact that FED will slow down. As I have mentioned in previous article, the run-up before Ben Speech probably did great injustice to the market. The great expectation of Big Ben being the market savior has probably played into the hands of the BEARS. The bears are probably already looking at any words from Ben to shoot down the market. It just does not matter anymore what Ben said! The most important thing is that the confidence of the market is already dented! 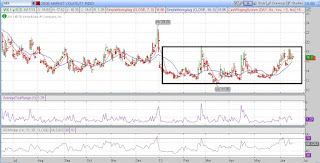 VIX, the Fear index is already showing its vulnerabilities. The downward momentum is gaining strength. 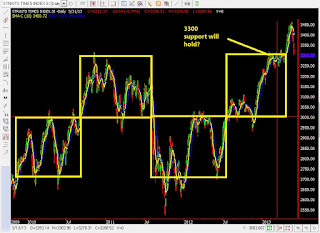 We think DOW has a chance to reach 14000. If it reaches that point, then we think it is SHOWTIME again! 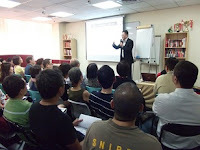 On 20 June 2013, Thu (English Seminar) or 21 June 2013, Fri (华语讲座Chinese Seminar). Indeed Dow decreases 100 plus points after Ben long awaited speech like what we predicted yesterday. A drop. The main reason is that the expectation of a miracle on Ben is too much, and has already been priced into the run-up. I expect the recent run-up to slow down. 2moro we shall give u more of our views. For now, tatas. It is time to sleep, after a predictable speech. Expectation before Ben Bernanke, but what about after? Today DOW increases by another 160 points. It is 3am in the morning Singapore time. However given the recent rise in the DOW, I predict that expectations of Ben giving reassurance that QE won't be stopped might have already been priced into the recent run-up. I expect the market to slow down or even retraces a bit after the announcement. I did said that I would look at STI between 3000 and 3100 points as I feel that this is a good place to buy some stocks cheap. Congrats to the courageous who went in to scoop up some stocks the day when STI reached our first support at 3100. But I must admit I am also surprised by this sudden rebound. STI is at 3220 now. But why is this rebound occurring? Everything boils down to our Big Brother, the US market. US has been relatively unhurt by the Asia market weakness. Big Ben again saves the collapse temporarily. US probably only suffers a small bruise. I have mentioned time and again that Big Ben is a good market psychologist and he is my number 1 American Idol. Not only has he saved the US market from collapsing in the Lehman Brother collapse, he brought US market to all time highs even when the employment rate is still at a high. Clever manipulator of the market. That is y everybody is looking towards his American Idol appearance again on TV tomorrow. 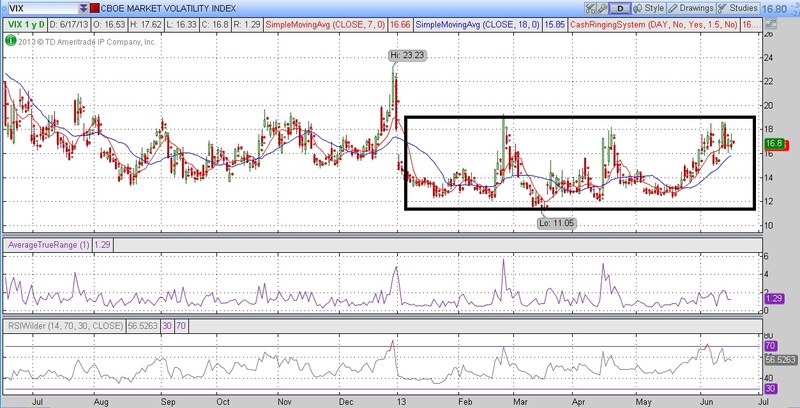 Recently US market has an increase in the VIX, a measure of volatility by studying the S&P500 option prices. It is nicknamed the FEAR index, and it goes inverse with the market. It spiked up to $18 and drops back a bit. I am looking at it to see if there is a chance of breaking the consolidation pattern. It has been traveling in between $12 and $18. 1) STI is poised for a short term rebound. Look and accumulate at those oversold STI component stocks. 2) When u buy, do not park all your money inside, accumulate the stocks up. Divide it into a few portions. Be prepared to buy again when your stocks fall by 25%. This will take into consideration when market turns down again. 3) Do not focus on those mid cap and penny stocks that did not drop much. 4) Focus your eyes on US market and the VIX to know the sentiment of the market. Any weakness can still bring Asia down. We would of course update. 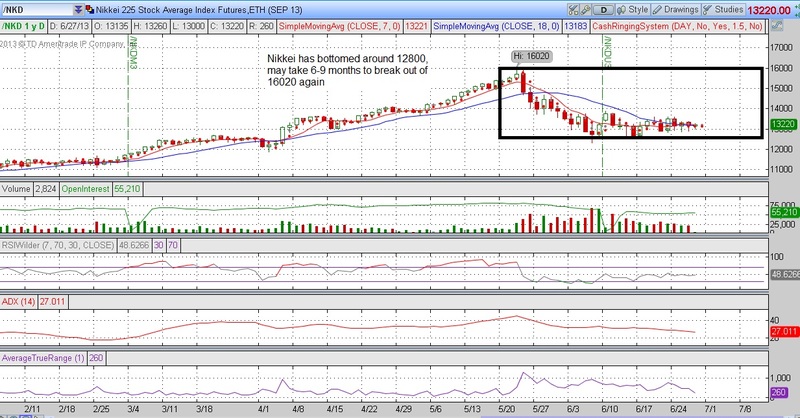 As what we explained, we predicted that Nikkei may have already bottomed. 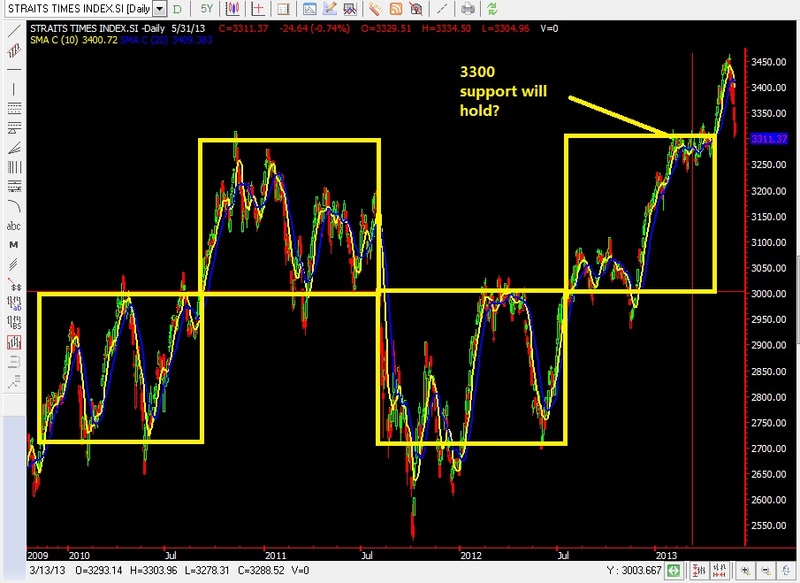 We mentioned last week on radio FM958 that we expect Nikkei to have a strong support at 12800. We do expect Nikkei to have a rebound from its recent sharp fall. Recently days have shown Nikkei consolidating as we mentioned, stabilized a bit and have moved up. Mid Term wise, we think this index is worth a look. STI gains for the year are wiped out totally in 3 short weeks! STI today breaks the price of 3188, the opening price of this year. And this happens in a matter of 3 short weeks of trading after a 4 months increase. Yes, everything is wiped out. We are at a deficit of 18 points now for the year. Given US and Japan strong showing for the year, STI really looks a great disappointment. 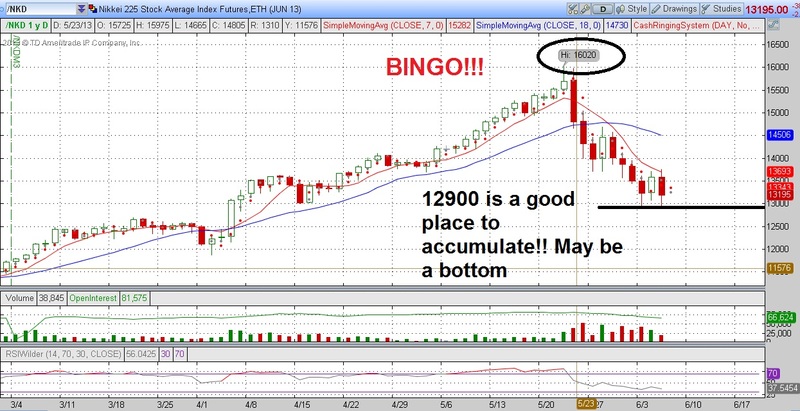 This is a timely reminder that the market can be very unforgiving when everything turns bad! All gains of the year can be wiped out in a month. It is always good to be cautious when things are too good to be true, when everyday the stocks are running. Remember that Nikkei can tank 1000points in a single day amid the bullishness. Do remember that this is a terrific OPPORTUNITY! Every market will have its turn of bullishness and bearishness. I know that KL stocks recently have a great run. The run will halt one day. Rotation will occur. And maybe SOON, it will be the turn for STI component stocks! I am looking closely at STI component stocks, especially when it is near my targeted 3000-3100 region. A 150 points drop in Dow Jones being wiped out in 2 hours shows Bulllisness still? Today the Dow actually drops by 150 points in the open, following the weak performance of Asia and European indices. However, 2 hours into the opening session, Dow actually clawed back its losses. Now it is just 20 points off. US market does seems to be bullish still. It does seem that there has not been a correction yet, not with this good comeback. I am still waiting for a weakness in the index. 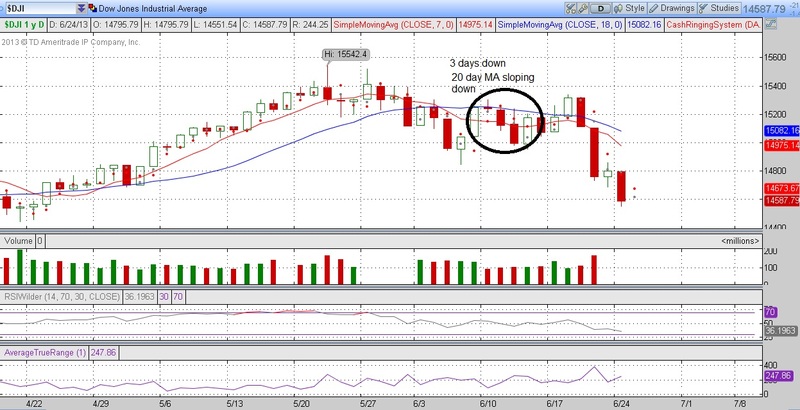 I am still looking at whether the index can drop for 3 consecutive days. On Friday, Non-farm payroll beats the expectations with a actual result of 175k against 167k. This indeed came as a surprise to me and Wallstreet as Wednesday ADP employment figures did look very bad. Wallstreet actually expected a bad result. In the end, on Friday, Dow climbed 200 plus points. This is the result of a good employment figure. This employment figure actually saves DOW from collapsing. All seems to have shown Dow dropping before the report. In the end, the fundamental report saves the day. Carrying forward, with today's bullishness in the market, I think the downward spiral momentum has not yet arrived. It might take really something to dent this US market confidence. On 6 June 2013, Thu (English Seminar) or 7 June 2013, Fri (华语讲座Chinese Seminar). Malaysia Investment Seminar: What are the stocks to invest in after Election now? KLCI has been fluctuating between 1750 and 1800 points. What is the direction now? Are there some stocks that have done well recently in KLSE??? What are some of the stocks that you may invest in after election? Stocks like PWROOT has done well these few months. All these SECRETS will be found in our INVESTMENT SEMINAR in Bangsar, Malaysia!! We will also be touching on how you should prepare yourselves after election and for this year also. Be sure to join us for an investment seminar this FRIDAY 7th June 2013, 7.30pm - 10pm! Is the 200 points drop in US a sign of more weakness to come? The coming week is considered a VERY important week for America. Having dropped for 2 consecutive weeks did indicate a slight turning in confidence in the US market. I am looking for signs in the US market to tell me that the general market sentiment has changed. On Friday, the Chicago PMI figure, which measures the enterprises performance, is excellent. The actual figure 58.3 is so much better than the forecast of 50.3! Looking at the american market for the past ten years, I have not remembered beating by such a large margin. And YET, the DOW acutally goes down 200 points on Friday. Possibly I suggest those looking for bargain hunting to be patient and wait a while this week. Let us study signs of how American market takes in the reports. It is important to know what the market confidence is like now. Tonight, we have the important ISM report, which I think would likely beat the consensus figures given the strong chicago PMI last Friday. This wednesday and friday's employment figures should be a "NOT SO BAD" results too. For the past 2 years, May employment figures have always shown a drastic drop and fared less than expectations. This round, it seems that employment is still OK. So let us see how the market reacts. In summary, if US market drops amid the Good ISM report and the "Not so bad" employment figures, then a danger sign of a waning confidence may be showing up. Be prepared for more backlash should it happens! I am sure you would have known that STI has recently been subjected to weakness after dropping from a high of 3464. On Friday it closes at 3311 points. Oh, what a drop, 150 points drop in 6 trading days. Throughout these few months, we have been preaching all to be careful and wait for the big drop to occur. Although STI dropped 150 points, we still think that it does have more room to drop IF US does fumble. So far, US is still relatively strong. Looking at the STI, we feel that short term wise there is a support at 3300. 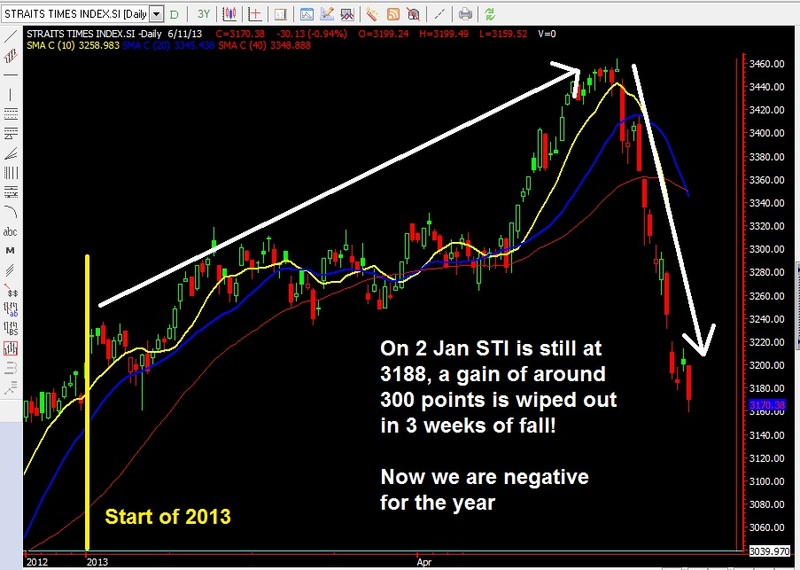 Breaking down through 3300, STI may have the chance to drop to 3100. IF STI does drop to 3000-3100, we feel that it will be a terrific chance finally to buy some stocks cheap. But having said that, if 3300 support holds, STI will have the chance to move pass the 3450 resistance. We did mention about 3450 being a resistance on radio 3 weeks ago. But we never expect such a drastic drop given that US stock market is still relatively strong. 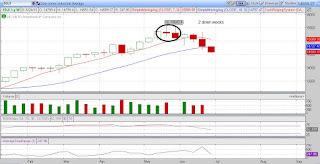 In the radio interview, we also mentioned that STI has a MUCH MUCH bigger resistance at 3600 if it is reached this year! Do take note that 3600 is a MUST SELL figure for both short and long term investors.